New research from the University of Washington suggests a milder youth for our planet. An analysis of temperature through early Earth's history, published the week of April 2 in the Proceedings of the National Academy of Sciences, supports more moderate average temperatures throughout the billions of years when life slowly emerged on Earth. "Ideas about the early Earth's environment are all over the place, from a very hot world, to one locked in a permanent ice age, from a world with acidic oceans to one with seawater so alkaline it would sting your eyes," said David Catling, a UW professor of Earth and space sciences. "These simulations show that our early world had about the same average temperature as today, and a seawater pH within roughly one unit of neutral." "Our results show that Earth has had a moderate temperature through virtually all of its history, and that is attributable to weathering feedbacks — they do a good job at maintaining a habitable climate," said first author Joshua Krissansen-Totton, a UW doctoral student in Earth and space sciences. To create their estimate, the researchers took the most recent understanding for how rocks, oceans, and air temperature interact, and put that into a computer simulation of Earth's temperature over the past 4 billion years. Their calculations included the most recent information for how seafloor weathering occurs on geologic timescales, and under different conditions. Though we don't think of wind and rain wearing away at the seafloor, the seabed is eroded as seawater percolates through rock on the ocean's floor. Carbon-containing molecules settle out from the water, a process related to the temperature and acidity of the seawater, while other chemicals are dissolved from the rock. 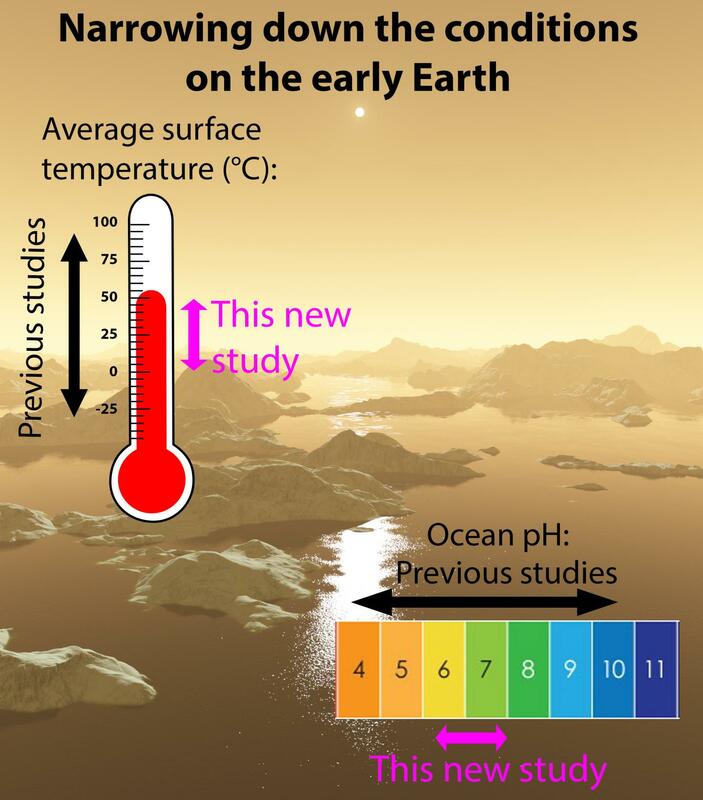 "We got this initial answer that early Earth had moderate temperatures and slightly acidic ocean pH," Krissansen-Totton said. "I tried really hard to break that, looking for assumptions that could possibly change that answer. But I found that this is a really robust result. It's hard to imagine a realistic scenario where temperatures or pH were more extreme." That is good news for the search for life on other planets. If Earth's temperature was pretty moderate throughout its history, other planets located in the habitable zone must also retain a fairly stable climate long enough for other lifeforms to evolve. "There's nothing particularly remarkable about these processes," Krissansen-Totton said. "They can occur on any rocky planet with oceans. So other planets that are in the habitable zone are likely to have their climates stabilized to moderate values by these weathering feedbacks. And that's a good thing for the search for life, because you need moderate temperatures for billions of years to have a stable environment for life to evolve." "The results help us understand how natural processes kept Earth's environment suitable for life to carry on for billions of years, from its humblest beginnings to the wonderful forms now around us," Catling said. The paper's other co-author is Giada Arney, a research scientist at NASA who contributed as part of her UW doctorate. The research was funded by NASA and the Simons Foundation.